Giles Cadman, Chairman and Founder of Cadman Fine Wines, says his ambition for the company is to enable customers to share his love for wine, by providing high quality wines at reasonable prices. This extends to a web site operation where wines may be purchased by the single bottle, and a wide ranging portfolio with real depth and strength. General Manager Paul Trimming cites “championing diversity, lesser known winemaking areas and small-scale producers,” amongst his interests. Cadman sent me this selection of their wines to try and it was an extraordinarily consistent and delicious line-up. Domaine de Fondrèche is clearly a star of the Rhône’s Côtes du Ventoux appellation, whilst the Blanc de Blanc Champagne from Franck Bonville is ‘grower Champagne’ at its very best. The line up also includes four New Zealand wines, two beautifully made whites from Marlborough, and a pair of top-notch Pinots, one from Central Otago and one from Martinborough. All in all, a truly impressive selection. Franck Bonville (France) Blanc de Blancs Champagne N.V. I have to say this Champagne is a bit of a find. Franck Bonville are fairly large family growers, and I guess third generation winemaker Olivier Bonville has some older reserve wines and really good fruit at his disposal, especially since no less than Bollinger is a customer for his grapes. This all-Chardonnay cuvée is as refined and racy as it is delicious. Small, pin-prick bubbles precede a nose that has white flower nuances to racy citrus and crisp apple fruit, with just a hint of something hazelnutty in the background. The wine races across the tongue, with a firm, tingling mousse, and stays very fresh whilst flavours of ripe orchard fruits, nuts and a little fig and honey develop. This is complex stuff, and would be interesting to cellar for a year or two – though delicious now. 90/100. £22.99, Cadman Fine Wines. 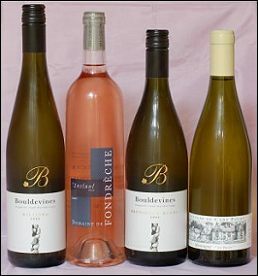 Bouldevine is a new name to me, though the winery was established in the 1970’s. This Sauvignon Blanc comes from two blocks within the estate, which have very different characters. Each is vinified separately before blending in the proportions required. This pale green wine has a lovely nose, with a trace of honey to passionfruit and slightly smoky, gunflinty, quite exotic notes. On the palate there’s a big Marlborough burst of lychee and gooseberry, with vivacious fruit and a sweet, tropical ripeness. But this is nicely contained, and that lime and grapefruit precision of acidity starts to reinforce the mid-palate, leading to a succulent, long-finishing wine with very nice balance and enough restraint to be food-friendly. 89/100. £8.99, Cadman Fine Wines. The nose is delightful aromatic, with the merest hint of beeswax over lime leaves and a distinctive, lightly floral minerality. On the palate this is immediately fresh, succulent and mouth-watering, as racy citrus fruit and acidity floods across the tongue. This is a dry and gossamer-light Riesling, but there is no sign of thinness or tartness; just fresh, juicy, clean-as-a-whistle fruit and acidity in a balanced package. Delightful stuff and should age very gracefully. 89/100. £9.99, Cadman Fine Wines. From Montagny in the Côte Chalonnaise, this part-barrel-fermented white Burgundy comes from the du Besset family’s domaine, and offers a wonderful harmonious, beautifully-pitched nose, where orchard fruit aromas of apple and pear marry with a hint of honey and oatmeal, and plenty of vivid, lemony freshness. On the palate this is nicely dry and clean, with just the merest hint of a nutty, cashew background to otherwise pristine Chardonnay fruit, edged with lemon rind and finishing with impeccable balance. There’s plenty of fruit and easy-drinking charm here, but some lovely finesse too. 90/100. £10.99, Cadman Fine Wines. From the Côtes du Ventoux vineyards of the much-vaunted Domaine de Fondrèche, this blend of Cinsault, Syrah and Grenache has a beautifully delicate ‘partridge eye’ colour, and a refined, gentle nose of redcurrant and raspberry with a suggestion of leafiness and a touch of schisty minerals in the background. On the palate is fresh and vivid, with crisp red fruits and plenty of cleansing citrus. This is a very fresh and clean style of rosé, crying out for a plate of charcuterie or some poached salmon, and is deliciously refreshing. 87/100. £7.99, Cadman Fine Wines. A 50/50 blend of Grenache and Syrah, this joyous little wine has a bright, breezy, up-front character with creamy raspberry fruit and a certain confiture character. But then an little edge of something gamy and schisty creeps in, adding a layer of complexity too. On the palate the sweetness of the black berry and autumnal, slightly smoky fruit powers through, with spice and a bit of grippy tannin adding texture and weight, and crisply-defined plum-skin acidity adding a nicely tart and juicy note to add savoury balance in the finish. 87/100, £6.99, Cadman Fine Wines. From generic Bordeaux to Premiers Crus, the 2005 vintage continues to impress in Bordeaux. This wine has an unusually high proportion of Malbec in the blend – 20% – along with 70% Merlot and 10% Cabernet Sauvignon. It has a vibrant crimson colour, and a delightfully supple nose of blackcurrant and black cherry fruit, a touch of Sandalwood and a creamy hint of violet and plum. On the palate this is quite firm, with a grainy tannin structure and a firm, authoritative edge to the precisely-defined black fruit. It has energy and life about it, with good acidity and that structural spine, and is an impressive petit château for medium-term cellaring. 89/100. £9.99, Cadman Fine Wines. One of the leading estates of the Côtes du Ventoux, winemaker Sebastien Vincenti has made a really lovely, silky wine here from 50% Grenache along with 30% Syrah, 10% Carignan and 10% Mourvèdre. It has a vibrant crimson colour, and a perfumed nose of bright red berry fruit, with little touches of briar and old roses. On the palate the tannins are positively seductive, with spice and chocolaty ripeness. The fruit is layered and smooth, and the plum and blueberry depth plays nicely against crisp cherry acidity and again that tugging, schisty, earthy core. Delightfully fresh and energetic stuff at a very good price. 90/100. £9.99, Cadman Fine Wines. Blended from 80% Grenache, with Mourvèdre and Syrah, this is a Côtes du Ventoux take on classic Châteauneuf-du-Pape. It has a big, meaty, stock cube and layered plum and cedarwood nose, with plenty of spice and sweet fruit intermingled with leather and herbs. The palate has a very pure, very focused core of black and red fruits that are sweet and rounded, but the ripe, softly cloaking wrap of tannins and charry, spicy oak adds lots of breadth and depth, and the nicely pitched acidity just freshens things up. Another deeply impressive wine from this estate with a long, chewy, powerful finish. 91/100. £10.99, Cadman Fine Wines. If Nadal is Sebastien Vincenti’s take on Châteauneuf-du-Pape, then I suppose this could be seen as his Hermitage, made from 90% Syrah with a dash of Grenache. In fact, it is another hugely impressive, hugely powerful wine much more in the Châteauneuf style, aged in a mix of barriques and large foudres. It has an inky crimson/black colour, but there’s nothing inky or over-extracted about the nose, as baked plum pie, coffee and garrigue herbs and spices give a lovely perfume. On the palate the black fruit has precision and focus, with tightly grained tannins and a brisk, cherry skin and charcoal biscuit acidity giving freshness and bite. The big, meaty, spice and woodsmoke richness pushes though on the finish, in a another terrific and well-priced wine from this star estate. 91/100. £12.99, Cadman Fine Wines. I was impressed by the 2004 of this Pinot when I tasted a huge line-up of 180 New Zealand Pinots a couple of years ago. Specialising solely in this one Pinot bottling, Wycroft has a very limited production and is sold on allocation, so don’t hang around too long if you fancy a bottle or two. Aged in new and one-year old French oak, this has loads of mocha coffee rich, dark, brooding presence on the those, with a plush layering of plum and black cherry, but a lovely briary ‘Pinosity’ too. On the palate it is undoubtedly deep and full-flavoured, but there’s an immediate sense of freshness too, and this wine avoids any hint of over-extraction or heaviness. The spice and char of the oak marries to the fleshy ripeness of fruit, but crisp tannins and a edge of cherry-skin acidity produces lovely balance and length. Very impressive Pinot with cellaring potential. 91/100. £21.99, Cadman Fine Wines. 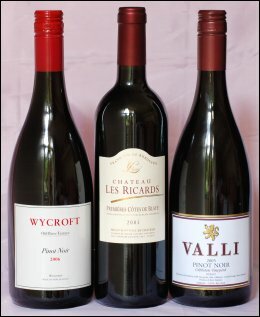 I was introduced to the wines of Valli estate when I had dinner with winemaker and Burgundy nut Grant Taylor back in 2003, when he quoted a 19th century Italian oenologist, Romeo Bragato, who in 1895 wrote ‘There is no better country on the face of this earth for the production of Burgundy grapes than Central Otago.’ That was fairly far-sighted of Signor Bragato, as it took 100 years for Otago to come to the world’s attention for that very reason. This 2005 was aged in French oak, about 30% new, and comes from a vintage that produced only 250 cases. 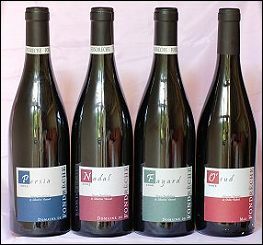 There’s great freshness and fragrance here, with herb, old rose and truffle nuances over quite savoury raspberry fruit. On the palate this has a medium-bodied texture, and a very Burgundian feel as the silky fruit is layered with game and herbal nuances before a spicy finish. Complex and intriguing, this is drinking well now but there’s no hurry. 90/100. £22.49, Cadman Fine Wines.